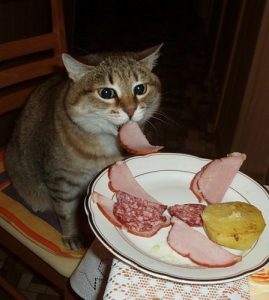 Cats are carnivores and would surely expect a share of your ham burger, ham sandwich or honey ham. Can you give them some? Yes, in very little amounts. Big chunks, when provided on a regular basis, may lead to adverse health conditions. Do not give your cat raw or uncooked ham as it might result in bacterial infections. The AAHA (American Animal Hospital Association), CVMA (Canadian Veterinary Medical Association) and AVMA (American Veterinary Medical Association) have advised not to add raw or half-cooked meat to diets of dogs and cats. Though rich in a whole lot of vitamins (B1, B3) and minerals (potassium, selenium, zinc, copper, phosphorous) it would not provide any other benefits to cats other than meeting their protein requirements to a certain extent. One cup contains about 1684 mg of sodium, higher than the cat’s daily requirement (42 mg). Hence eating ham slices in excessive amounts may result in salt poisoning and dehydration as well as kidney problems in extreme cases. Take your cat to the veterinarian if it is vomiting or showing any unusual symptom after having ham. Canned ham must be a no-no for your cat as it is cured or processed, thus having a high salt content. Do not give it out-of-date or old ham as it may cause diarrhea. Keep plenty of cool and fresh water by its side as your cat might feel extremely thirsty after eating a piece of it. If your cat is pregnant, consult with your vet before giving it even a small piece of it. Published on September 9th 2017 by Maxi Gold under . Article was last reviewed on 20th November 2017.